Olivia Rawlings’ life could be summed up by how many different colors she dyes her hair: restless, rootless, and ready to run when life gets complicated. The only thing constant in her life is her baking, Salty (her dog), and Hannah, her friend. Even her relationships are complex. The scene opens up with Olivia setting fire to the restaurant because the restaurant owner is the man she is having an affair with and he won’t leave his wife. She’s not an arsonist. It was the combination of a wobbly food tray, vertigo, and 150-proof rum on sweet desserts set on fire. She finds her way to Guthrie, Vermont after quitting the Emmerson Club and in the employment of Margaret–a troubled and cranky Bed and Breakfast owner who doesn’t keep bakers around for too long. While two different colored threads seem unrelated, the book begins to bring the fibers together at long last and we learn more about Guthrie, its gossip, its people, and why Margaret is cranky. We learn about Olivia’s friendship with Alfred. It is my sincere hope that Alfred gets his own story in the next book. He was too nice a man not to find his own, “happily ever after.” The only blemish was something that clashed with my own worldview as a Christian, but that part appeared and passed; almost felt preachy. Almost. The whole book doesn’t align with Christian beliefs, but it does reflect the rough areas and choices of life. Having worked as a hostess, the people I worked with were like Olivia–jaded and foul-mouthed at times. Olivia’s character is perfectly outlined. She starts out rough, runs as per her character from a perceived situation, and in the end, makes the right choice. 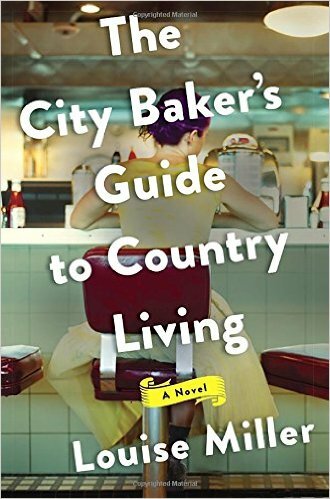 We grieve when she grieves and cheers when she finds her way out of the entanglements of her choices and own prejudgments of a town that had come to love this fiery, outspoken, and unusual baker. I closed the book with a contented sigh. Never prejudge one chapter. I wish Christian fiction would write realistically like this, because we all began broken and God made us whole. We make mistakes, but when we repent, wonderful blessings abound. I love how Olivia became whole again. It’s amazing what happens when you stop running. Now when does Alfred get his own story? I would love to see him find happiness. *Book given by publisher to review. Reviewed from a Christian perspective.